We all have, to degrees, a sense of sight (ophthalmorception), one of sound (audio), taste (gustao), smell (olfaco), and touch (tactio). In addition we have the neural capacity to sense temperature (thermo), movement (proprio), pain (noci), balance (equilibrio), and vibration (mechano). Some animals have the capacity to sense electric fields (electro) and to detect polarized light. All of these sensory modalities allow animals to gather information about the environments in which they find themselves. Consider that there are also mechanisms by which we are able to unconsciously, autonomically, sense and to then regulate the biochemistry of our internal environment. In addition to these, I believe that many of us are aware of, or possess, senses other than those we consider to be traditional. This post is about those capacities. The ones we have all spoken about, on occasion, either in reference to our own abilities or to those of others. In my experience at least, it is the sense of prescience, the ability to know of events before they happen, to which most of us refer when we say something like he acts like he has a sixth sense about him. I believe that she is in possession of a supernumerary sense. I call it Ecothesia or, I suppose, Ecoception. This new word is derived from two Greek words: Eco (οἶκος), for house or environment, and the suffix thesia, a derivative of aisthesia (αίσθημα), meaning perception or feeling by the senses. She does more than observe sign, listen to song, taste wafting scent, smell the air, and feel the wind. She perceives nature in a deeper, more profound, way. She senses the wholeness of the environment around her, as if it were a living thing. Some view the Earth as a single, self-regulating system composed of a number of feedback loops between and among component parts, the biosphere, the atmosphere, the hydrosphere, and the lithosphere. The Gaia hypothesis contends that the planet represents a dynamic equilibrium of the component loops. The parallels between such a construct and a living organism have not been lost on those who view our planet as a living organism. Perhaps her ecothesia is evidence of this? It is instructive to accompany her on walks. Sometimes she’ll slow down or stop to look, admire, and to observe. Sometimes, when she stops, I see that her gaze becomes fixed in the distance. It is then that I know her ecothetic sense is at work. It is at times such as these that she collects information that is beyond the reach of my own, traditional, senses. Who knows the source or modality of the information. Regardless of its form, it allows her to know whether the environment within which she stands is healthy or sick, thriving or just getting by, or injured. We experienced wintry conditions today. Snow and mixed precipitation. Yesterday was beautiful though and we walked. A few days ago she had returned to report another pretty fungus. So pretty, in fact, that she had a picture. She showed me. Because I overlooked the stump, which would have provided scale, I assumed the fungi were of the usual grocery-store-size. It took her a few minutes to relocate her find. When she did, I was surprised by how very small the individuals were. Each of the caps you see is only 5 mm or so in diameter. These fruiting bodies are elaborate extensions of the much larger mycelium which lives within the soil. The mycelium forms from the union of two mating types of hyphae. 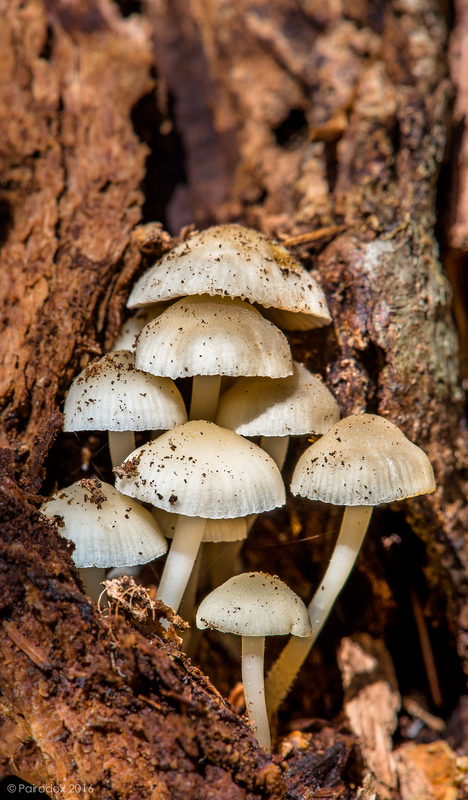 The hyphae are produced from spores which are, themselves, products of the fruiting body. What wonderful creatures. Among the first to break free from the hold of winter.